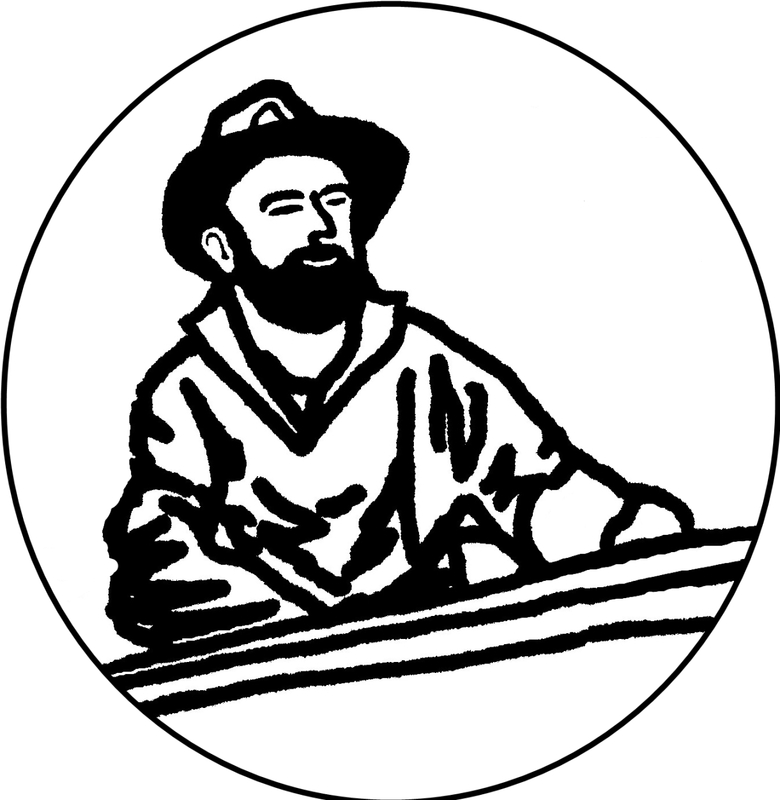 The canoe launch is today, Father’s Day, June 17th , 2018, at the Hollyburn Sailing Club. Paul carries the canoe to load onto the FJ. 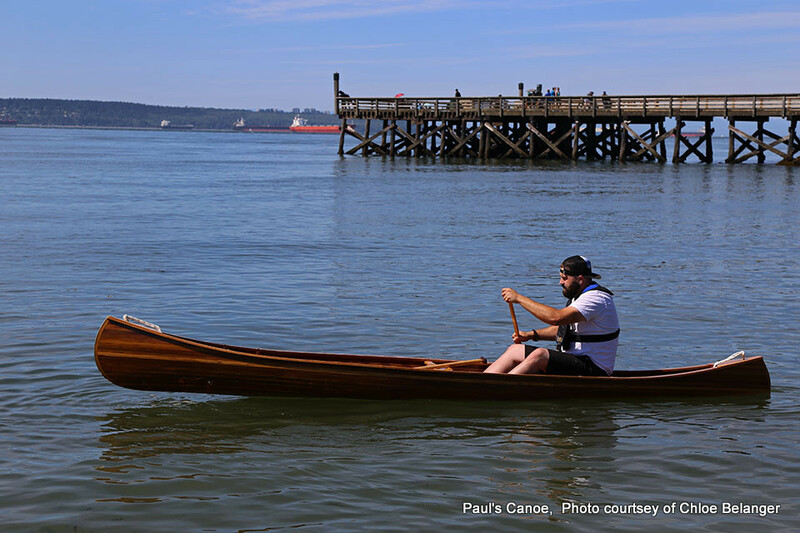 Paul easily picks up and carries the canoe. I have taped towels onto the roof rack crossbars. We centre the canoe and I tie it down. 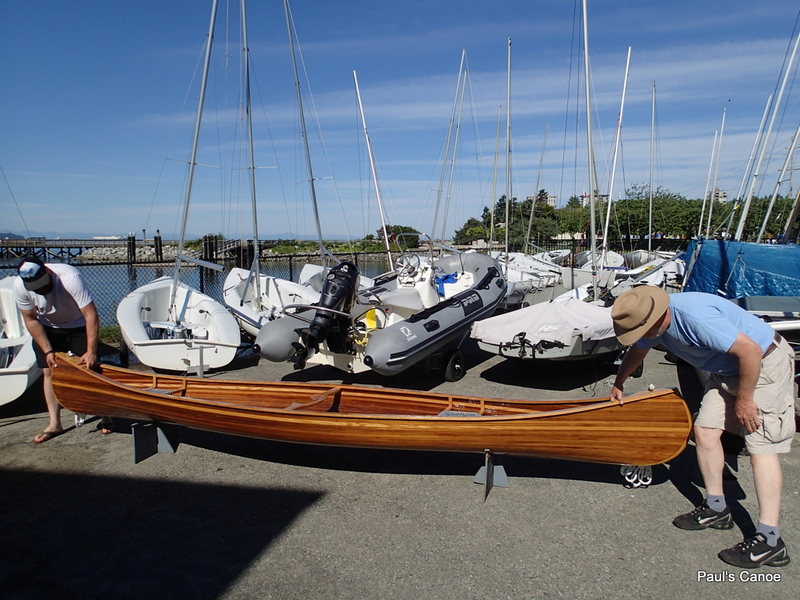 The now bolted-in bow and stern rings work well.. Feel very secure. 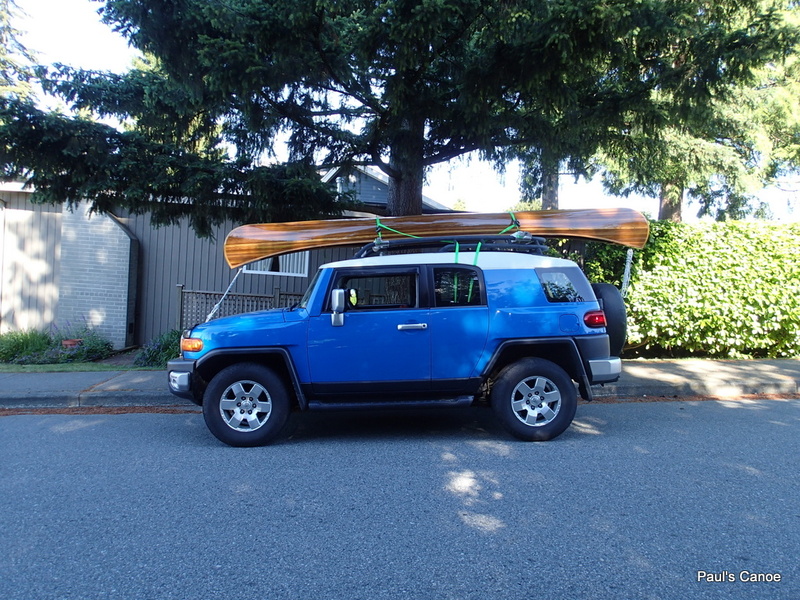 The bow and stern lines are just the right length to tie to the FJ. Two green ratchet straps, (the ones used to hold the strips to the station molds) secure the canoe….It could be a little further forward? Unloading at the Sailing Club. Aside from all the admiring glances, an uneventful drive to HSC. 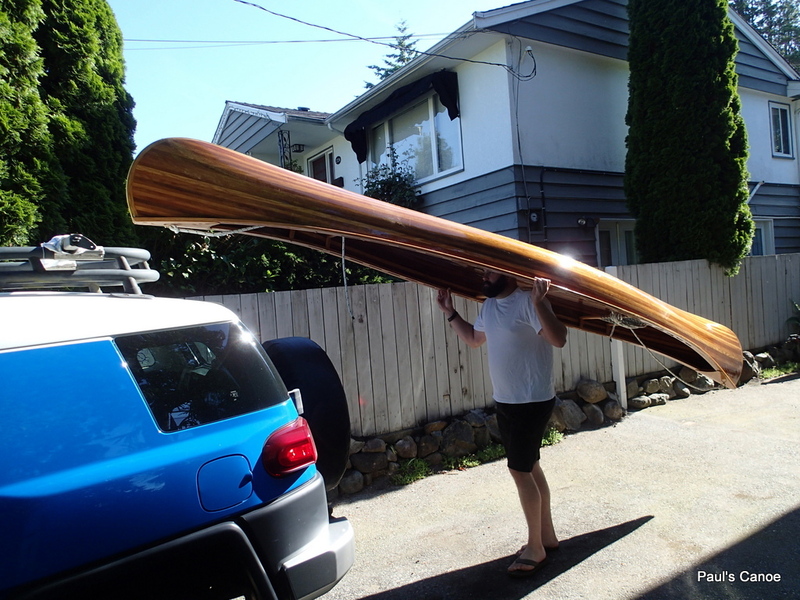 Paul and I unload the canoe and place it on two kayak stands. It is a light carry into the Club. 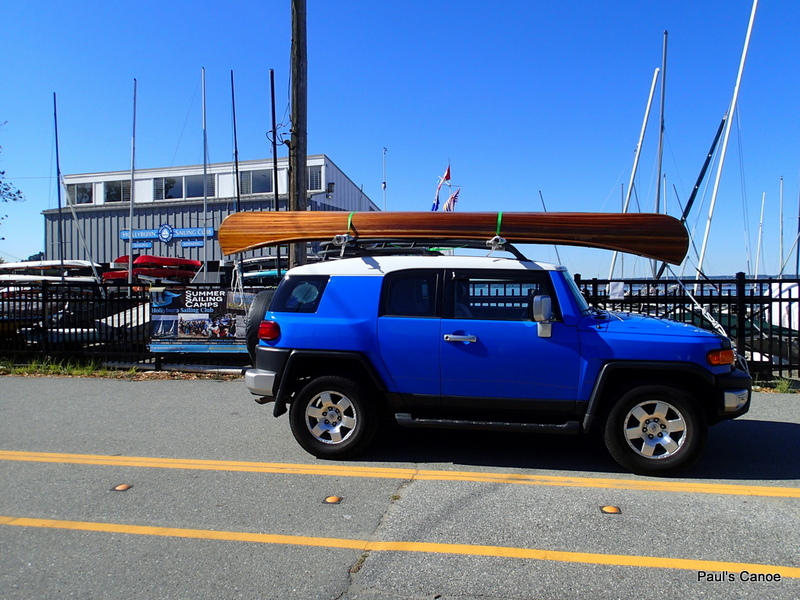 We get the paddles and I park my FJ in the Ambleside Park parking lot. 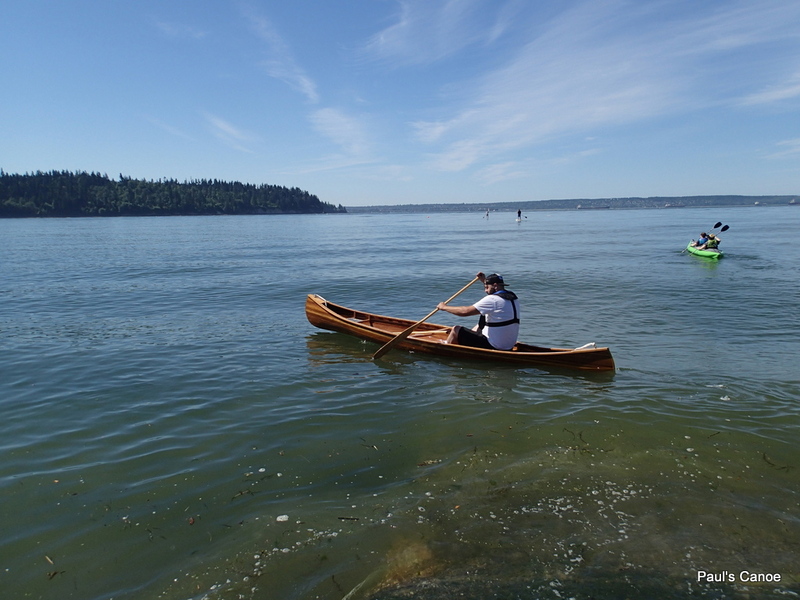 Paul’s paddle is 66″ long and mine is 63″ long. (Paul is 6’2″ and I am 5′ 9″) Today will be a good time to test the lengths for comfort. Paddle length is always a bit of a guess. Today we will fine-tune the lengths. 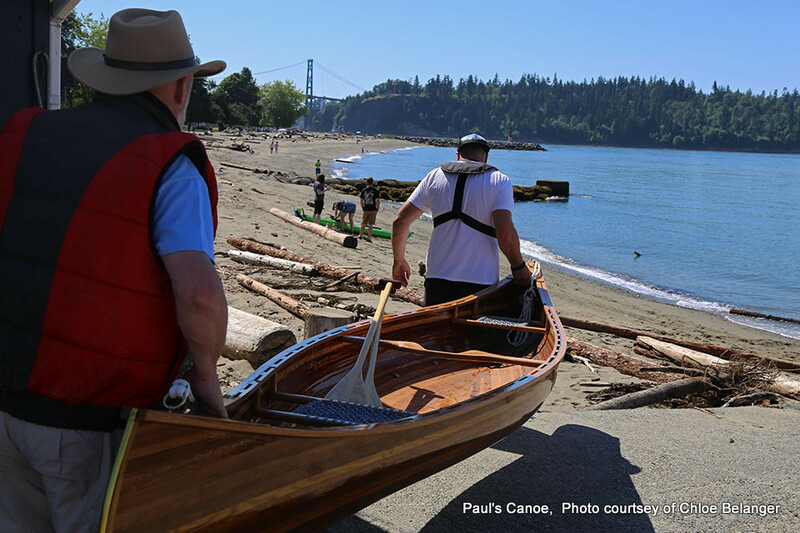 We get our life jackets on and take the canoe to the beach. Paul will take the first paddle solo. Paul is not one for a lot of ceremony. Getting in, waiting for the swell to moderate. And away Paul goes…No flip, no dump, no hesitation. 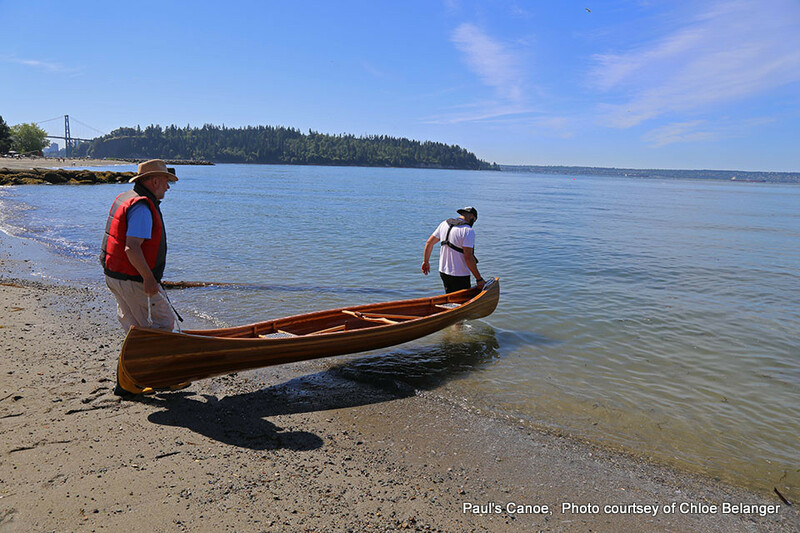 Paul takes the canoe for a test paddle. Looks good! The canoe is a little stern heavy. Paul has good balance sitting on the seat. He could be a little more forward. Paul tries sitting on the floor of the canoe just forward of the seat and the balance is perfect. Paul does several circuits, trying out different sitting positions and both paddles. He is quite pleased with the results. 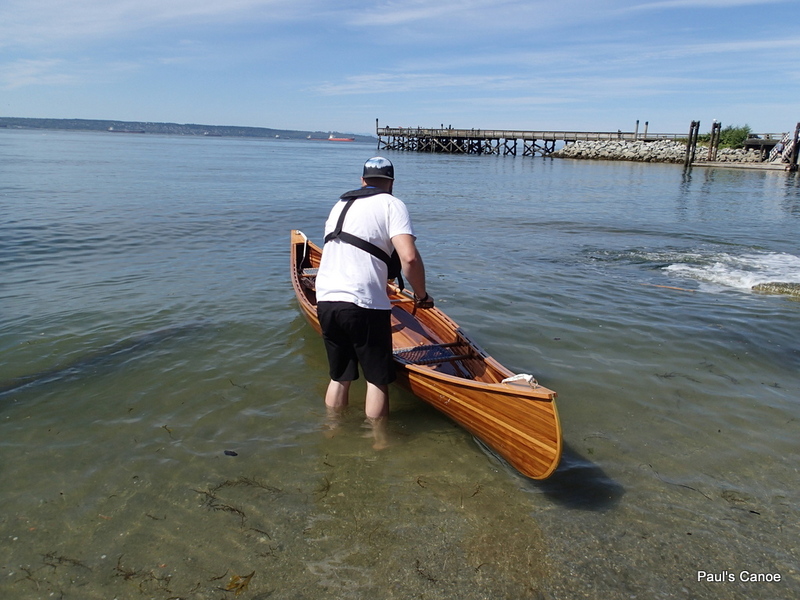 The canoe tracks well, feels quite stable and is easy to paddle. 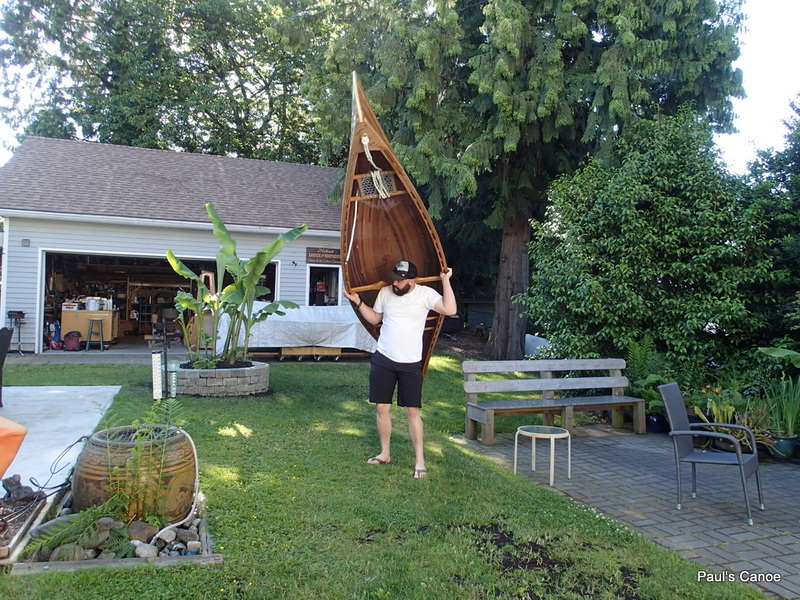 Paul and I are happy with the canoe, still unnamed. Paul feels that his paddle is too long and my paddle is maybe a little too long as well for him. 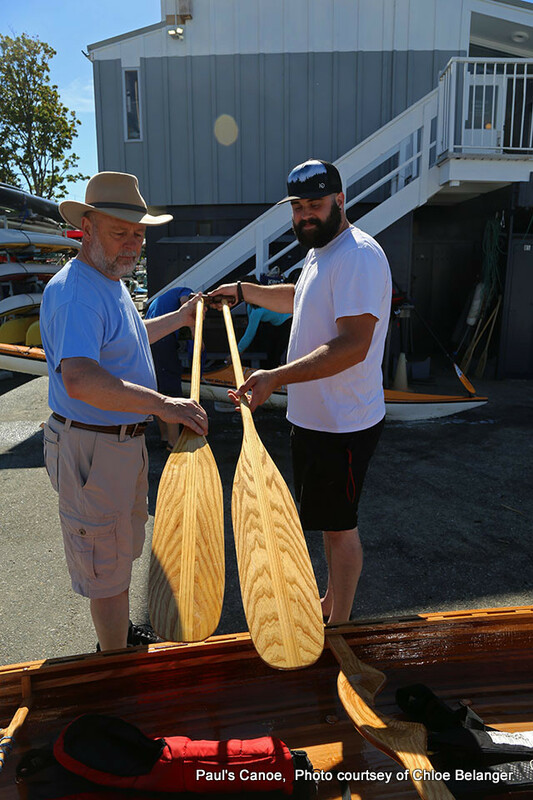 We will take about 6″ off of his paddle and re-attach the handle. We will come out again soon for another paddle trial. My wife and I take the canoe out for a spin. The balance with two paddlers is perfect. The canoe looks level. No photos of that paddle. 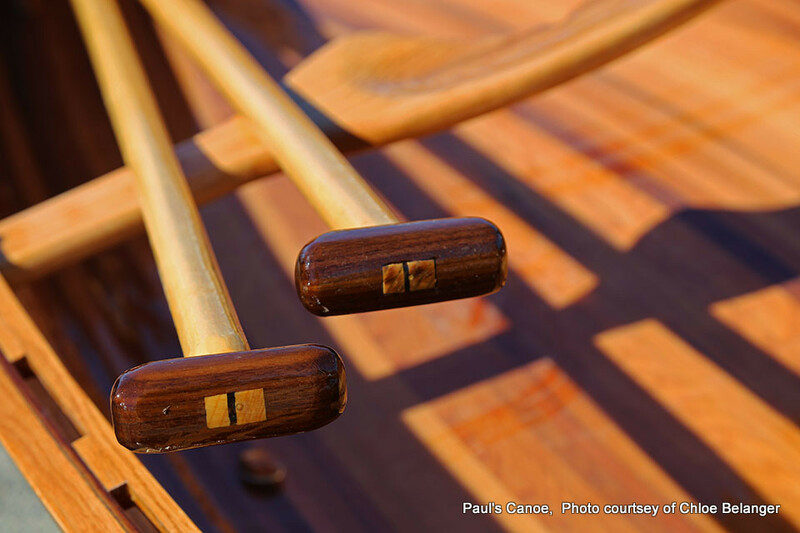 Paul’s canoe will be ideal for two paddlers and their gear. 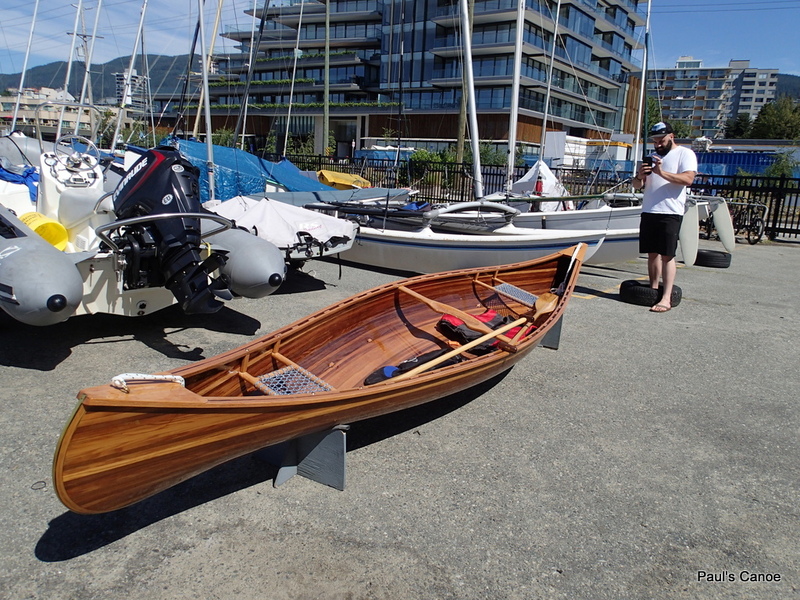 An expedition canoe. 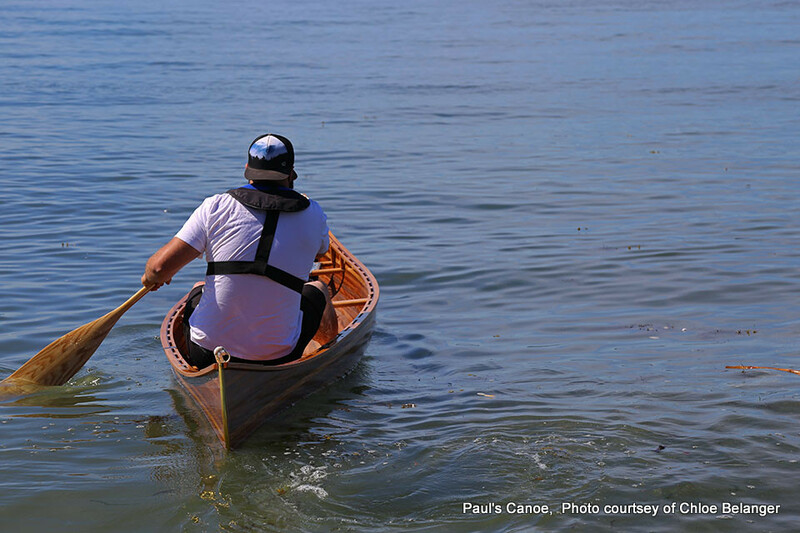 Paul did want to do some tripping and this canoe is the one for the job. A quick rinse before we go home. 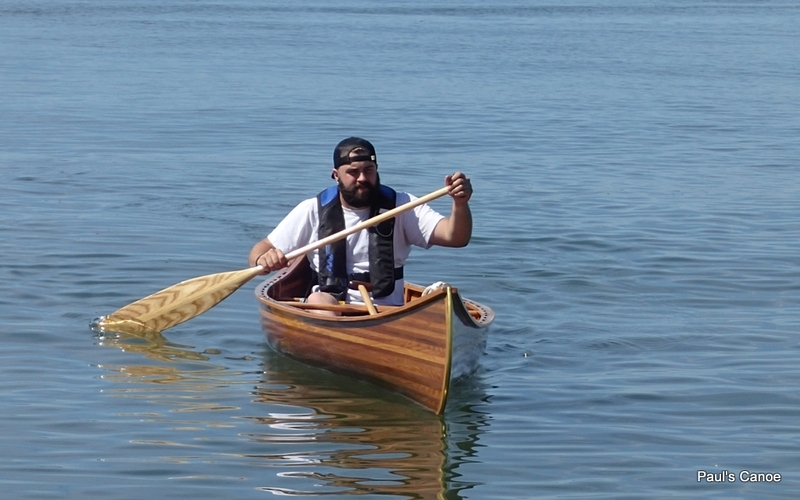 Final stats for Paul’s Canoe: Overall length: 15′ 3″. 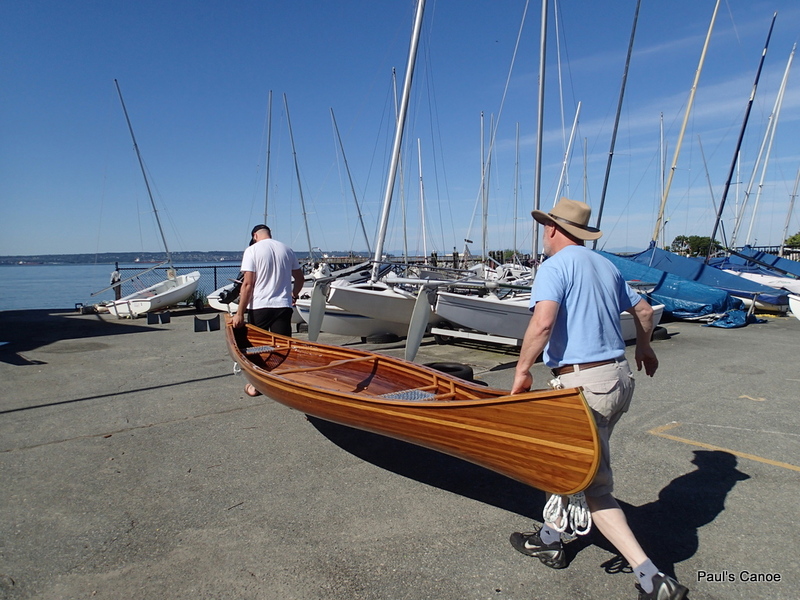 Width to outside of gunnels: 35¾”, Width to outside of hull: 34¼” Depth of hull: 11½”, final weight 60 lbs. Bow height 19″.